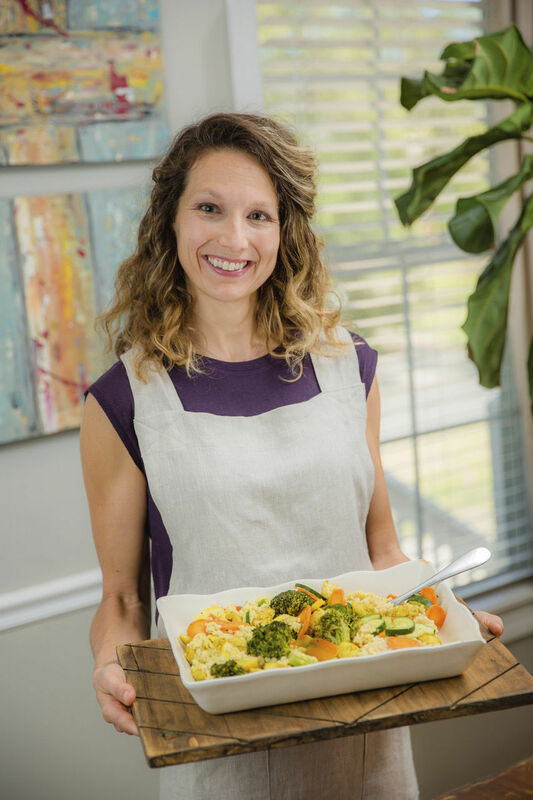 Sarah Davidson, chef and owner of Simple Meals on St. Simons Island, stands with her chicken and roast vegetables dish. With the arrival of 2019, so too comes a flood of resolutions to improve oneself. From increase in exercise to spending more time with family, almost everyone has a goal to pursue. It’s something that Sarah Davidson understands. The local chef and owner of Simple Meals, based in the Club on St. Simons Island, feels that it’s simply human nature to want a fresh start to accompany a new year. “For everything there is a season, and I think it is built into us as ‘people’ to want to look at the New Year as a new beginning, to recalibrate and reflect on where we’ve been and a chance to make changes in our lives so that we can become who we want to be, and one of those things is often ‘getting healthier, or back on track,’” Davidson said. Of course, she knows that can mean a lot of different things depending on the person. But one focus that seems a constant is improving one’s diet. While it can be a daunting task, it is certainly something that pays off. “It’s a great place where small changes can make a big impact. Diet can also be very confusing where in our culture today there are many different ‘plans, thoughts, rules, and theories’ to what eating healthy means,’” she said. Her business aims to make clean eating as easy as possible. It provides whole food casseroles for those who want to stay healthy amidst busy lives. 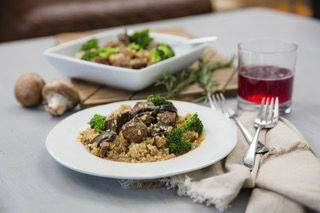 They offer meals throughout the week that are all gluten free, no processed sugar and are able to be modified into most eating plans, such as vegetarian, paleo, keto and maker’s diet. More information about their business is available at SimpleMealsSSI.com. “Our meals are fully prepared, therefore you gain more quality time with your family or friends, just bake, and serve. We bridge the gap between being busy and still wanting to enjoy a healthy meal. And there is no membership at The Club required to enjoy Simple Meals,” she said. Of course, Davidson understands that making a lasting diet change can be a bit of a challenge. One of the things her family finds beneficial is to do a thorough purge of the pantry, refrigerator and drawers. “I’ve noticed that if the junk food is not available I’m not tempted as much to eat it. If there is only good food available in my house, my office, or my car to snack and go to then I will make a wise choice,” she suggested. Planning more formal meals can also help when it comes to staying on track. The Davidson family, which includes Sarah’s husband Justin and their two children, take time to map out what dinner will look like throughout the week. “Seven meals seems to be the perfect place for us. With seven meals, there is enough variety that I’m not repeating too much, but I can also shop and plan for the 7 meals, without feeling like there’s nothing to eat,” she said. One of her family’s go-to meals is a simple chicken and roasted veggie spread. It is an easy yet satisfying way to enjoy filling and healthy foods. So much so, in fact, there’s also room for dessert. “A simple, first dinner recipe that is easy and tasty to do is roasted vegetables, and grilled chicken. This recipe is beneficial because it is so adaptable. You can add to the base of this recipe and try different vegetables and create endless new meals options. This is also a meal that is quickly prepped for easy week night meals, or can be made ahead to be used in lunches,” Davidson said. Combine all ingredients in a bowl or freezer bag. Add chicken and toss well to combine. Marinade for a 30 minutes (or up to 4 hours) before cooking chicken. Preheat grill to medium high heat, ~400 deg. Place chicken on the grill for 7-8 minutes. Flip over and cook an additional 7-8 minutes or until no pink remains and chicken reaches 165°F. Rest 5-7 minutes before slicing. This step seals in all the juices and flavors of the chicken. This recipe can be followed by baking the chicken as well if you do not have a grill, bake in an oven safe dish at 400 deg until chicken internal temp reaches 165. This recipe can be prepared with any vegetables of your choice, zucchini, squash, onions, tomatoes, broccoli, cauliflower, you can get creative. Prepare all vegetables into 2 inch slices, or cubes. Combine all vegetables in a bowl and toss with coconut oil, salt, and other seasonings. Bake in 400 deg oven for 25-30 minutes stirring every 10 minutes until desired texture is reached. The trick with any grilled chicken and with eating whole foods is the seasoning. Always begin with simple salt and pepper, and then you can add chipotle, lemon pepper, jerk, or Italian. Check out the seasoning aisle and experiment to find a favorite. Again make sure to read labels, as there can be hidden sugar, or chemicals that you cannot even pronounce. Blend all ingredients in a blender to an ice cream consistency, creating a “ice cream” dessert alternative that is just a banana! You could even serve this for breakfast with whole strawberries or blended together. What kid or adult would not enjoy ice cream for breakfast. This dessert is great because we won’t have that feeling like we are missing out, when we are enjoying a bowl full of ice cream after dinner, even though it is just a banana! Find a friend, we all work better with someone else to encourage us, share the highs and lows, and a little friendly competition. Grace to know that you will at some point eat something you regret, or think isn’t good for you. Do not quit, or feel like a failure. Start again on your next meal. Small changes make big impacts, begin today just walking 5 minutes, instead of feeling like you need to go to the gym for 45 minutes. Change high sugar, breakfast cereal, to an energy packed smoothie, or egg. Read labels, there are so many hidden sugars, chemicals, and highly processed items in so many things we eat. These additives, are what is making it difficult to lose weight, and feel great. Eat real food. How to know if it is real food, think about how it would grow naturally. When you are eating quality ingredients you will not need to be concerned with calories and portions. Your body will naturally be able to process real food and give you the best nutrition.